MOORESTOWN, N.J. — It was hot. Frankly, it was really hot. 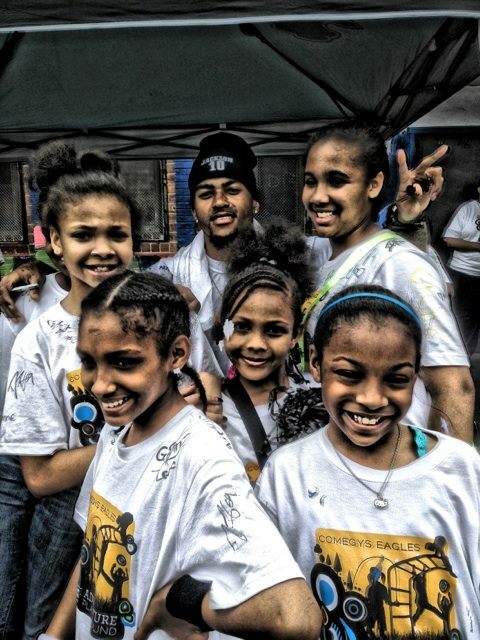 Then again, kids aren’t exactly worried about the heat when they get to take the field with an athlete like DeSean Jackson. 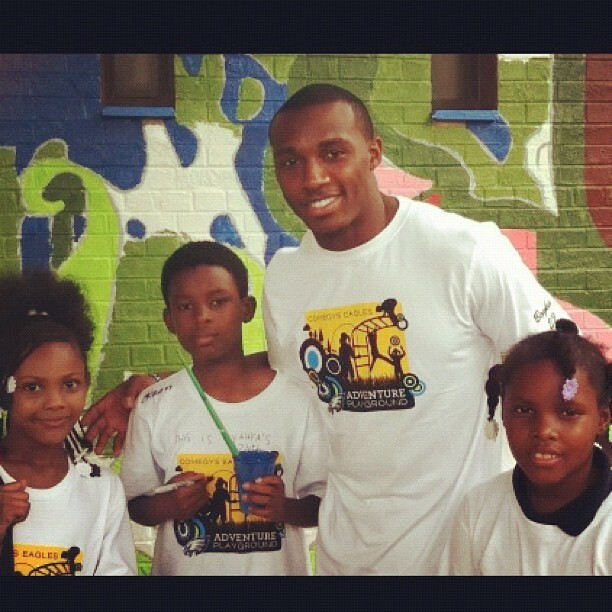 The Eagles’ wide receiver hosted his third-annual football camp for local youth Friday morning. It’s a two-day program in which Jackson and his staff coach kids ages 7-16, providing lessons for use on and off the field. Over 150 kids dressed in shorts and camp T-shirts ran drills as Jackson and his staff shared tips and shouted words of encouragement, words that, coming from a Pro Bowler, have an extra chance to resonate. The camp isn’t Jackson’s only foray into mentoring youth. He appeared on the “The View” last year to meet with a local boy who was being persistently bullied. 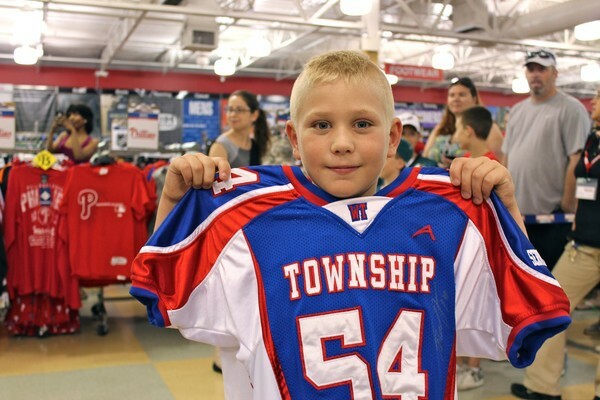 A big fan of Jackson’s in the first place, he received an autographed jersey from No. 10 himself. The sight of Rosenhaus not just at the camp, but also in an Eagles hat certainly says something about how times have changed for both he and Jackson. Once public enemy No. 1 dating back to his press conference in Terrell Owens’ driveway, Rosenhaus is now sporting the team’s logo following an off-season signing period in which three of his clients — Jackson, LeSean McCoy and Evan Mathis — inked long-term deals with the club. As for Jackson, his future with the Eagles became increasingly uncertain last season as his contract concerns remained unsettled. Now, Rosenhaus is wearing the team hat and Jackson has a five-year, $48.5 million contract, $18 million of which is guaranteed. Things like this — the camp, for instance — allow Jackson to show a side of himself most fans don’t get a chance to see. Still, for as much as he enjoys taking the opportunity to use his fame for good, next season remains at the forefront of his mind. “Everybody knows we’re due for a Super Bowl,” Jackson said. “I think everyone understands that and we know it’s not an easy task. The past couple years of me being here, being so close, getting to the playoffs, and then last year not making the playoffs, I think the team and the coaches are at a level now where we understand what it is [to have an opportunity to win] and know what’s at stake. So were the more than 150 kids on the field Friday, getting a chance to interact with someone like Jackson. 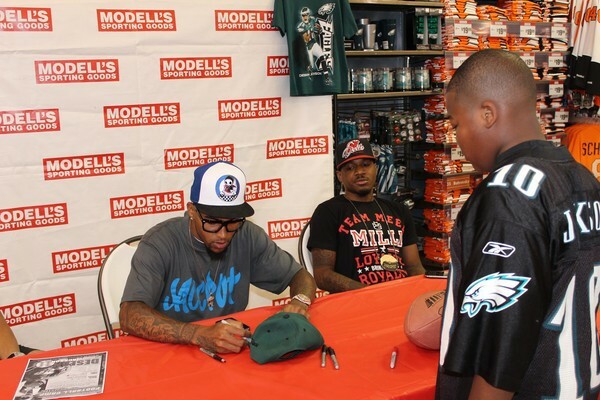 Philadelphia Eagles wide receiver DeSean Jackson made the day of many young fans Monday when he signed their helmets, jerseys and posters at an appearance at Modell’s. Several fans were starstruck at they watched Jackson sign their items. “Wait,” Zaki Thompson of Collingswood yelped, turning back after an encounter where he just grinned at Jackson. “You’re my favorite player!” he exclaimed before rushing off again. Kristopher Hoagland was more impressed. He approached the autograph table confidently as the first person in line. Clad in a #10 jersey, his reason for coming out was simple. 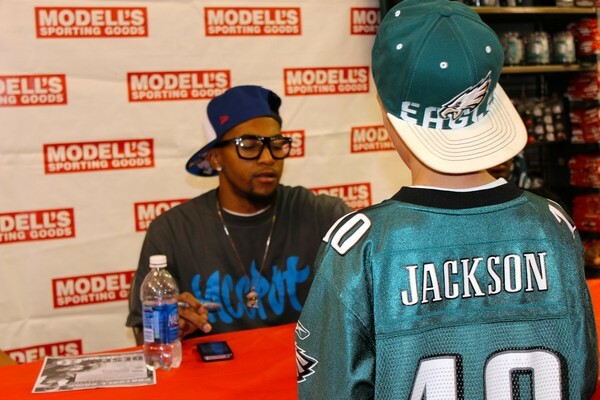 “I just want to meet DeSean Jackson,” Kristopher said. “Growing up, I went to a lot of professional camps and it motivated me. As a young kid, the best thing you can do is be challenged,” Jackson said. 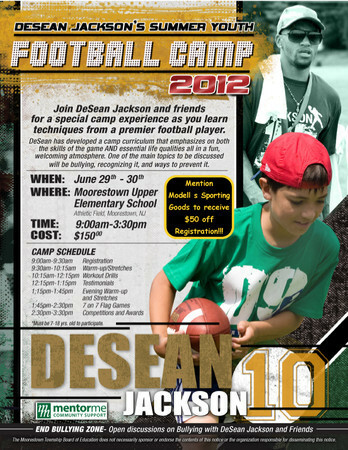 Jackson’s camp, now in its second year in Moorestown, includes an anti-bullying message. Published: June 20, 2009 at 01:29 p.m. Updated: June 20, 2009 at 02:39 p.m.
LOS ANGELES — Offseason is a time to renew and rebuild. But for DeSean Jackson, it’s been a time to reflect. And grieve. Only a month has passed since he lost his dad, Bill, to pancreatic cancer. In losing his dad, he also lost his lifelong coach and No. 1 fan. “This whole season, the rest of my career, I’m dedicating to my dad,” the 22-year-old wide receiver says. If there’s one person responsible for Jackson’s success, it’s the man who pushed and led his son to where he stands today — coming off a franchise record-breaking rookie season with the Philadelphia Eagles. In the week leading up to Father’s Day, Jackson’s family gathered together at a friend’s home situated high in the Baldwin Hills overlooking Los Angeles. It’s the same house where the Jacksons waited out the long hours of Draft Day 2008, when the Eagles selected Cal wideout with the 18th pick in the second round. With the loss of his dad heavy on his heart, the comforts of family are most welcome now. Jackson grew up just east of here in Central L.A., with a dream to play in the NFL beginning when he was only 5 years old. Sundays were spent kicking back on the couch with dad watching football on TV. 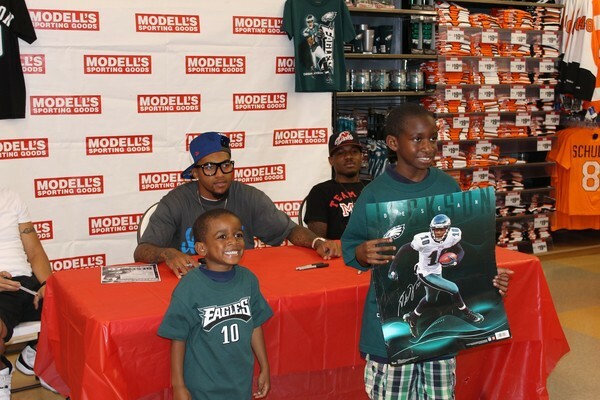 It was about the only time young DeSean stayed still. By Sunday evenings, his dad would have him out in the park, running patterns, catching quick and difficult passes. Always the fastest kid in the park, Jackson runs 40 yards in 4.3 seconds today. He inherited his speed from his dad, a track star who used to clock 10.4 in the 100 meters in high school. Back then, Bill had his sights on playing in the pros somewhere, somehow, someday. But his family believed the pursuit of an athlete’s life was just a dreamer’s dream. After high school, Bill went to work in the steel mills, and later on he drove a streetcar for a living. When his own father passed away, Bill and his wife, Gayle, moved to Los Angeles to make a new start. Here, Bill poured his passion for sports into his five sons, especially Byron and DeSean. “I remember Bill saying all the time, ‘I wish my dad would’ve pushed me,’ Gayle says now. Gayle and Bill divorced when DeSean was 6, but both parents remained devoted to keeping the family united. Bill raised his sons with the hope that each might someday play in the NFL. Overly involved parents can be found at Pop Warner fields across the California Southland. But DeSean knew that having a father there at all was the greatest blessing. DeSean and his dad were inseparable, driving around L.A. in a faded red Datsun 260Z from practices to scrimmages to games. At kickoff, there was no parent more boisterous than Bill Jackson. “I had the craziest Pops,” says DeSean. Eagles receiver DeSean Jackson and his family gathered last week in Southern California to reflect and to celebrate the life of DeSean’s father, Bill Jackson. 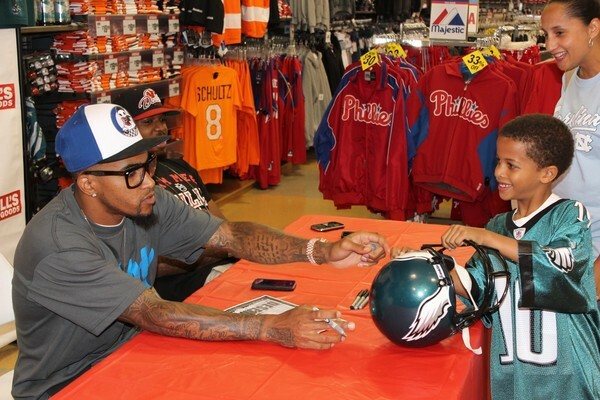 During games, he was clearly DeSean’s No. 1 fan. During home-cooked training sessions, he was the No. 1 coach. That heart carried him into end zones for the Inglewood Jets and the Long Beach Poly Jackrabbits and the Cal Berkeley Bears and finally now with the Eagles — where he was a key contributor last season on a team that fell one game short of reaching the Super Bowl. It was only days before last year’s playoff run that Bill Jackson learned he had pancreatic cancer. By the NFC Championship Game against Arizona, he was lying in a hospital bed. The prognosis was grim, but still found the strength to call his son after the Eagles‘ 32-25 loss. Three months later, in April, DeSean moved his dad from a Los Angeles hospital to a hospital near his home in Philadelphia. In one of their last visits together, his dad seemed to be envisioning his son’s future success. “He may have been dreaming, like he was at a football game, and he was telling me the score, and I could just remember him telling me he was at an Eagles game,” DeSean says, and then drifts off into the memory. Earlier on this day, DeSean spent some time on the Marina boardwalk where he and his dad used to stroll together. It was a clear day and he stopped awhile to look out across the ocean where his dad’s ashes were scattered. And in many ways, the spirit of Bill Jackson will live on, into the season, through his son. Lisa Wilmer isn’t one to sugarcoat things. Less than half of the students perform at or above their grade levels in math. The scores in reading are even worse. All the students get free or reduced breakfast and lunch. 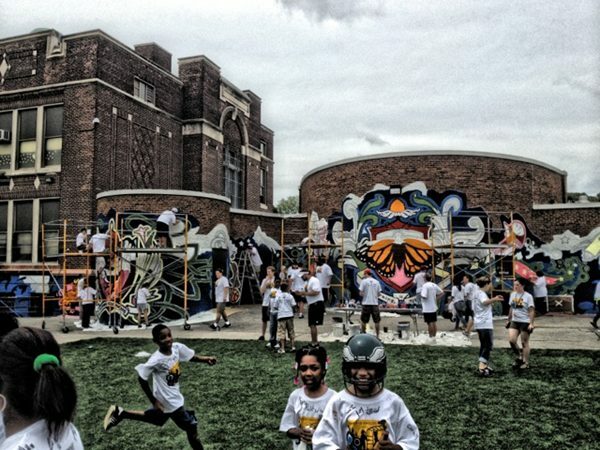 Basics that other schools might take for granted come hard for the school in southwest Philly. New books in the library? They barely have a library. But Wilmer says they’re working on that. A playground for the kids to blow off excess energy? For years, all they had was a concrete yard that kept the school nurse more than a little busy. Like I said, Wilmer’s not one to just let things be. 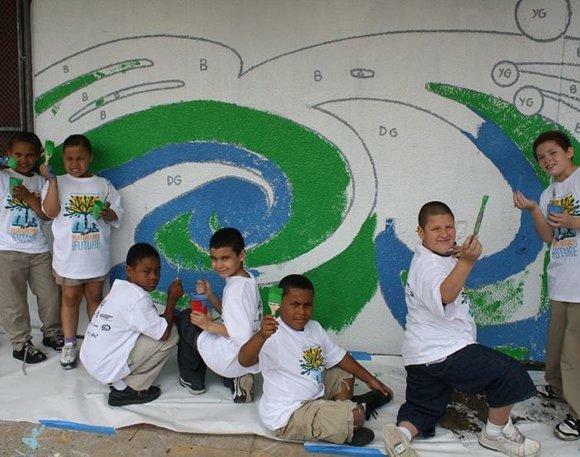 Years ago, the school applied for an Eagles Youth Partnership grant for a new playground. But there are lots of deserving schools in need in Philly. Comegys lost out. Last year, a freshly appointed Principal Wilmer decided it was time to try again. This time, she got it. 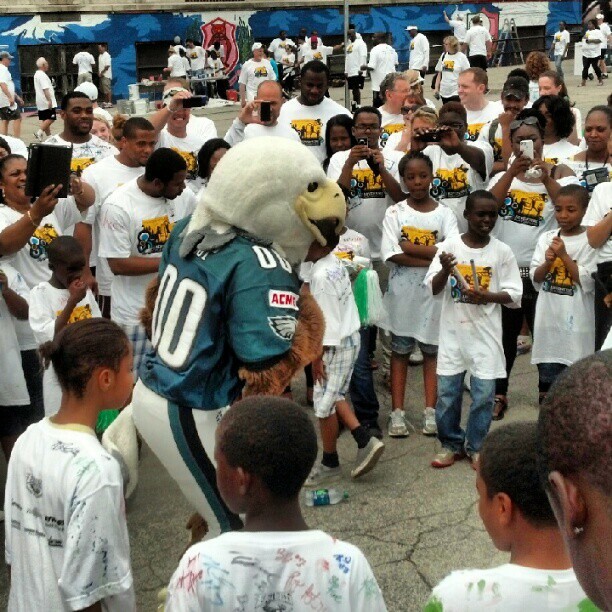 And on a sunny day last week, the Eagles organization descended on the school for their 16th annual playground build. 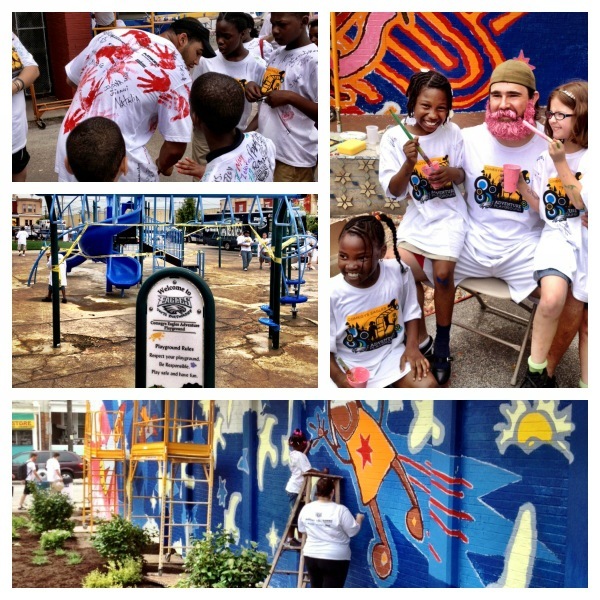 Up on a ladder, wide receiver DeSean Jackson helped paint a mural while posing for pictures and signing autographs. Below, lineman Todd Herremans poured concrete for the new playscape. On the field turf, Michael Vick tossed a football with kids who were clearly already dreaming. In short, build a playground, and dreams will come. 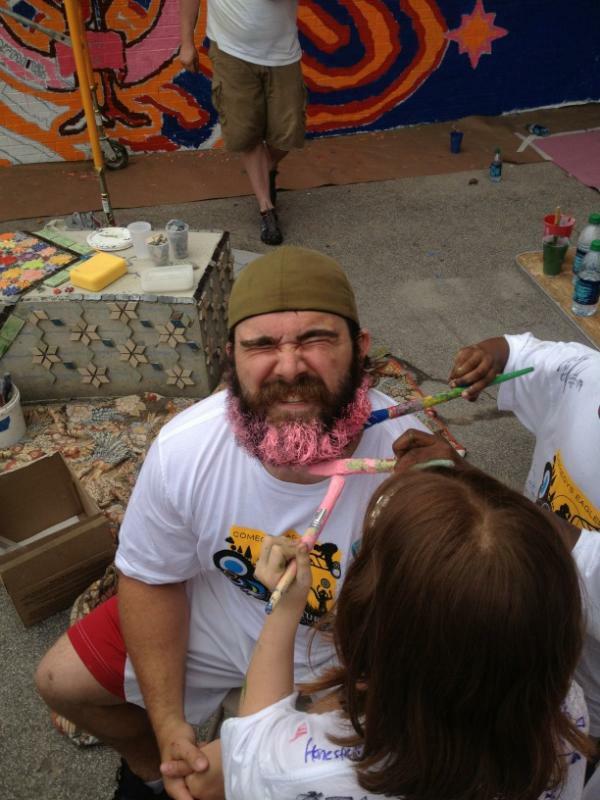 Even before the big build day, Principal Wilmer noticed a change. Beyond the excitement with each sketch of murals that took up nearly every wall outside the school or the delivery of mosaic benches and chess tables, Wilmer sensed a growing sense of ownership, and pride, among her students. Her students, she recalled, just sitting on their new benches for their new playground. She nearly burst out crying right there, she said. She noticed a change among parents too. The parents of kids who went to the school told her not to worry; they’d be keeping a close eye on the playground after hours. And those who bypassed Comegys every morning to drive their children to other schools suddenly got very curious about what was going on at the neighborhood school they’d long given up on. Wilmer came to the school 12 years ago to teach fifth and sixth grade. She was a good teacher, one who could have had her pick of schools. But even then she said she felt Comegys was where she should be. Four years ago, she became assistant principal and two years ago, she got the top job. And the way she sees it, a playground that should be a staple at every Philadelphia public school, but sadly isn’t, is part of it. The day of the build, the students looked like they might bust with joy. When I asked a group of kids what they wanted to play with first, they all spoke at once. 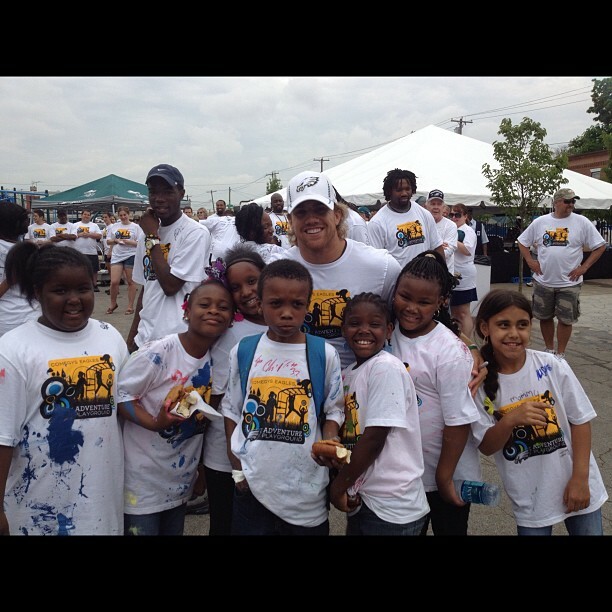 It took a while to find Principal Wilmer in the crowd, but when I did, she was beaming.